UNDER CONSTRUCTION: OH MY... LORD OF THE RINGS? I usually show up to Manhattan Meg's prepared to craft. I'm usually put right to work and I'm happy about that. Meg informed me we were going to throw a birthday BBQ for Michael at Kelly and Dave's. And that since Michael is a Kiwi, Kelly suggested a Lord of the Rings theme. What 43 year old man doesn't want a Lord of The Rings birthday party? I offered to make some paper chains... cuz... you know, they are rings? 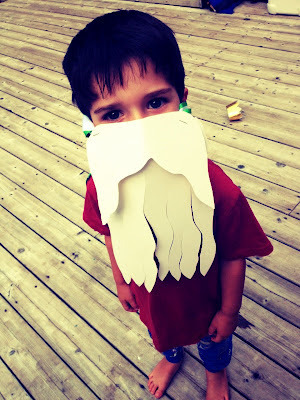 And then I made little Henry a little paper Gandalf beard because I like to overachieve. What amazes me about Meg is that she can take a not so chic/cute/craft friendly idea and make it look incredible. It was a beautiful party at Kelly and Dave's spectacular house in Sag, delicious food and Meg's creative touches. The classiest Lord of the Rings party I've ever attended.